For many with chronic illness or disease, exercise can be both mandated by their doctor yet seemingly impossible to achieve. The “spoon theory”, an idea that you start each day with a set number of spoons, and must “use” a spoon for every action- from getting out of bed to showering to making a meal to driving to work – has resonated with many who find their condition prevents them from sparing even a single spoon to exercise. They see their bodies suffering even more because of inability to work out, but despair at finding an activity that won’t empty their spoon drawer. Enter Pilates. When just walking to the mailbox proves exhausting, walking a mile is out of the question – but hundreds of Pilates moves can be performed sitting down, lying down, and so on. 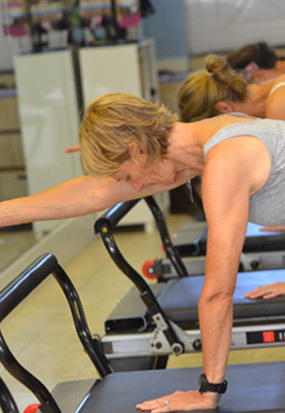 Pilates improves core muscle strength, stabilizes the spine, and tones your body slowly but surely. Endorphins released by even this mild form of exercise can improve mood and lessen depression. On good days, you can hit the studio for a group class; enjoying the camaraderie of being around other people and rejoicing in having that extra spoon to spare. When making it out of the house isn’t an option, do a few exercises at a time all throughout the day, and enjoy the benefits of each one. …and many other types of ongoing illness. You can trigger your body to ready itself for an energy boost by playing the same music track every time you get ready to exercise. Look for uplifting yet calm music, and consider adding a few moments of meditation to the beginning and end of your routine. This offers your mind and body a smooth segue into “work-out mode” and back again. Of course, ask your doctor before embarking on any new exercise routine. Then call Pilates of Rye and find out when the next session is that you can attend! Pilates is a routine from which your entire family can benefit! While many visualize a room full of young, fit women wearing leggings and earbuds when they think of Pilates, this discipline was actually developed by a man, and is used today by both genders and all ages as an effective, safe and core targeting exercise regimen. Pilates is an excellent way to prepare for the birth of a child (with a doctor’s approval), to recover post-partum, and to strengthen your bones and core to help stave off osteoarthritis. Pilates works for all ages and body shapes, allows you to build strength at your own pace, and targets all the muscles necessary for a tones look. Pilates was created by Joseph Pilates, a man who was a gymnast, a body builder, a diver, a boxer, a self-defense trainer and a circus performer by turns. Male tennis players, ball players, gymnasts, dancers and more turn to Pilates as a terrific tool for physical fitness, rehabilitation, and core strength building exercise. Whether Lizzie is looking for ways to improve her dance posture and balance, or Jimmy is struggling with motor skills and spatial awareness, Pilates is a great way to teach children discipline of their bodies while promoting exercise in a non-stressful, fun way. Don’t forget the seniors in your family! When strenuous exercise is too much, Pilates can offer a low impact, thorough workout to keep joints flexible and balance sure. Regular activity extends the lifespan, encourages normal bodily functions, and can reduce pain and inflammation from many common elder issues. Consider taking Pilates as a family! Everything is more fun when done together, and Pilates done as a group allows each family member to work at their own pace. Whether the body in question is that of a teen experiencing growth spurts, an adult experiencing a change in level of activity, or a senior dealing with the bowing and bending that often accompanies old age, Pilates can help. Teens: Poor posture and body alignment can be attributed to carrying heavy schoolbags, sitting hunched over a desk or computer for hours, and so on. Growth spurts can lead to a growing teen becoming clumsy and out of alignment, as bones often grow faster than muscles. Pilates can help with balance, coordination, and pain by gently stretching muscles, strengthening and straightening the body and correcting bad posture. Adults: Hours at a desk can take a formerly fit body and round the shoulders, ruin posture and cause cramping and pain in legs, neck and elsewhere. Pilates is low impact, and through strengthening of core muscles, correction of posture, and increased flexibility, can help adults be and feel healthier and more pain-free. Seniors: The commonly seen loss of flexibility and aching in the joints and muscles can be prevented for some by commitment to daily exercise. Walking is a terrific way to keep weight down and loosen limbs and Pilates can help to further enhance strength and flexibility. Both men and woman can benefit by strengthening their core, stretching their muscles and gently flexing their joints, which will help to preserve balance and prevent falls. If an injury does occur, patients who do Pilates heal more quickly and are more likely to regain their previous level of mobility. Athletes: Flexibility and core strength is a cornerstone of Pilates, and virtually all types of sports and physical activities require these in spades! From the ballet studio to the football field, Pilates can help increase muscle strength, improve flexibility and balance, and increase the ability of each athlete to reach higher levels of health, fitness and performance. In case of an injury, Pilates can help the healing and recovery process, providing a safe, gentle, yet thorough rehabilitation routine. Pregnant Women: A woman’s body goes through incredible changes during pregnancy. Pilates can help make abdominals and back muscles stronger, reducing the amount of strain and pain during the pregnancy and making labor and delivery easier. Pilates is also a terrific after-delivery workout, letting new moms safely and effectively regain their pre-pregnancy body with toning and core building. No matter what changes your body is going through, Pilates can be beneficial. Check out sessions with a qualified instructor, and find out how you can make your body change for the better! Many people associate “Pilates” with mental images of barefoot women in leggings and tank tops or sport bras, but this full-body workout routine is ideal for kids and teens of both genders and all ages! There is a wealth of benefits that can be gained from regular Pilates sessions, even if the child in question is already active – and if they aren’t, Pilates is a low impact, thorough workout that can get them in the habit of exercising regularly. Even kids who have trouble with most kinds of physical activity could benefit from Pilates and gain extra mobility and flexibility. Sporty Kids. Children and teens who play sports that involve extreme flexibility and range of movement will benefit from Pilates – hockey, tennis, rowing, basketball, swimming and lacrosse players can strengthen their bodies and help prevent injuries by doing Pilates a few times a week. It can also help them recover more quickly if an injury does occur. Dancing Kids. Pilates was used from its earliest days of conception at dance camps and employed by some of the top ballet dancers in several countries. It’s the ideal exercise routine to add to any dancer’s repertoire, adding strength and balance. If your child or teen is into ballet, hip hop, tap, modern or other dance styles, Pilates could be a perfect companion activity. Inactive Kids. Children and teens who don’t have a sport or other active passion can find a perfect exercise option in Pilates. Sessions are usually held indoors, the moves are achievable for all body types and strengths, and there is no expensive equipment to buy so funds can be put towards the cost of sessions with a highly qualified instructor. Challenged Kids. Children with motor control issues, kids who are in occupational therapy, or those undergoing physical therapy whether for rehabilitative purposes or to correct an existing issue can benefit greatly from Pilates. Originally called “Contrology” by Joseph Pilates himself, this activity can strengthen muscles, improve balance and posture, and enhance their self discipline. Check into Pilates for your kids and teens. Whatever their other skills or strengths, Pilates has something to offer everyone, regardless of their age or abilities – it’s a completely customizable program that builds on what your child can already do and takes them far past expectations. In addition, Pilates can be a terrific parent / child or family workout option – so think about signing up for group sessions! Aging can cause many people to slow down – whether consciously or unconsciously. However, this is the worst possible thing you can allow to happen! While your body may not be up to running marathons or pumping iron, staying mobile and active can actually keep your joints and muscles feeling younger – and increased physical activity has additional health benefits, such as lower blood pressure and cholesterol, higher disease resistance, improved balance and better motor skills. Most American adults lose one third of their muscle mass between 20 to 80 years of age. Being sedentary increases the risk of developing osteoarthritis and, osteoporosis. The Pilates Method includes over 600 exercises, which consist of precisely controlled movements that are low impact, but yield excellent results. Pilates can increase strength, flexibility and endurance; emphasized muscle tone without adding bulk; add joint range of motion; and improve your posture. Instead of stressing out individual parts of the body (which can lead to imbalanced muscle workouts, back pain, joint pain and even serious injury), Pilates targets the core and exercise the body as a single unit. Every inch of your body will be carefully stretched and worked out without creating undue stress on any single muscle group. You can do Pilates on machines that are specifically designed to strengthen and stabilize the spine, abdominals and pelvis, or do exercises on a floor mat with the same goals in mind. In either case, your own body becomes the true workout tool, so you are never working with more resistance or weight than you can handle. Pilates is the perfect workout for both lifelong athletes entering their golden years, and those who have not exercised in decades but see the need as joints begin to stiffen and muscles ache. A routine can be tailored to your specific needs and goals, to slowly but surely make you stronger and more at ease in your new body – all without sprains, strains, or exhaustion. Don’t assume that growing old means you can’t or don’t have to be active! Pilates can keep you young, slowing the aging process and increasing your flexibility, strength and balance. Bone density can be improved, and even your mood will be better thanks to the exercise. Call Pilates of Rye and schedule a session with one of our instructors to see just how fun and easy Pilates is – then sign up for our duet or groups sessions and start getting in the best shape of your life!